We often talk about housing density. We’re mostly in favor of it. In general, density allows more people to live in less area, resulting in small, efficient homes, walkable/bikable/public-transportation friendly living, more social living (by virtue of being closer to people) and smaller carbon footprint. We also talk about sprawl–density’s counterpart. Sprawl typically entails bigger homes, using up more space, pushing people further afield in socially isolated settings, necessitating more roads, more cars, more carbon, more everything basically. We tend to frame the density issue in terms of housing size, because it’s easy to understand that big homes, as a rule, reduce overall density. But there is something else, just as important as housing size, that must be factored in to understand how density works, and that is household size. Household size, as one might imagine, refers to the number of people that inhabit a given dwelling unit. If a six person family lives in one house, that’s a six person household. Without household size, it’s almost impossible to understand density. For example, if that six-person household occupies a 1,000 sq ft house, that’s 166 sq ft/person–a number that could rival any micro-apartment (assuming other factors like lot size, foot area ratio, etc are the same). It’s important to understand household size, because across the globe, the numbers are shrinking, resulting in more houses and less density. Let’s look at the United States to illustrate. In 1950, the average household contained 3.37 people. Today, that number is 2.6. In 1950, the average new house was 983 sq ft, or 291 sq ft/person based on the household size. The average new house in 2012 was just over 2500 sq ft, or 961 sq ft/person. It’s not just the Americans for once. All across the globe–in both developed and developing nations–household numbers are shrinking. For example, the European average is down to about 2.5 people/household–half as many as 100 years ago. Household proliferation is also due to aging, increasing divorce rates, and decreasing incidence of multigenerational households, which may be partly attributable to changing preferences for privacy. Indeed, the number of households may grow globally despite population numbers stabilizing. According to convergence theory, household size decreases (often from >5 to <3) as a society undergoes urbanization and industrialization. 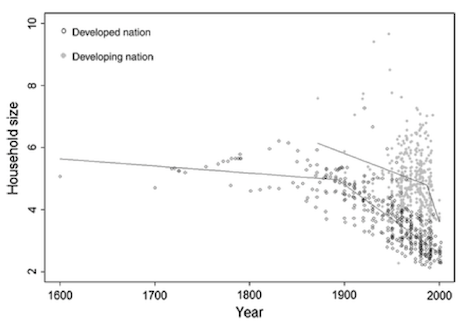 This trend largely occurred in developed nations during the latter part of the 1800s. If convergence theory applies to today’s developing nations, billions of households could be formed despite declines in population growth. That’s also 800 million more refrigerators and ovens and climate-control systems, 800 million more homes that need roads and sewage hookups and access to a power grid. If every one of those homes were the size of the average American home circa 2002, the researchers calculate that would mean constructing about 72,000 square miles of new housing on the planet. As a small space design blog, we’d be remiss if we didn’t mention that the amount of sprawl (i.e. the 72K sq miles) they calculate is based on a house size of 2509 sq ft–McMansions for all. Let things remain the same. Encroach on undeveloped lands and deplete all natural resources until the planet’s homeostatic environmental mechanisms are irrevocably destroyed. Reverse demographic shifts away from industrialization, the desire for privacy, divorce and so forth. Rethink housing. Adjust housing style to meet demographic shifts. Have smaller, more efficient houses with shared amenities. Creatively subdivide existing housing. Mitigate sprawl by keeping density high, even outside of major metropolises, permitting walk/bike/public transportation-friendly living. Options #1 and 2 seem like a stretch, so it could be time to start making houses that meet the needs of today’s smaller households. Why Are American Homes So Big? YES! I look at a lot of small house plans on the internet, and there’s a big difference between a 1000 sqft one-bedroom house and a 1000 sqft three-bedroom. Only the latter is of interest. I wish plan sites would let you search/filter on sqft/person. But for those of us who want to purchase an existing home, it’s not easy to find a small place for a small household in most areas of the US. My townhouse is aprox. 1000 sq ft which is small by local standards. The only place I found that was smaller was dark and dreary; sunny won out! I’d love a smaller functional place for my current household size but it’s not available here. I agree that it’s almost impossible to find a smaller, well designed home these days. My husband and I want to retire into more land but smaller house, but all of the small homes that occupy larger spaces are being redone and tripled in size. I agree, I’d like to move my 1 person 2 cat household to a smaller place, currently 900 sq ft, but everything in my ideal range of 4-500 sq ft costs almost twice as much as I’m currently paying; which even if I could afford it, I wouldn’t do. Perhaps small house size is contributing to the problem of larger house sizes. I’m thinking of a classmate many years ago – the oldest of 10 children. They grew up in a tiny two bedroom, one bathroom house. It couldn’t have been over 900 square feet. One of the younger siblings told my mother, who was his teacher that year, that he didn’t have ANYPLACE to put his things. I doubt he had many things – just a few clothes and school things and perhaps a toy or two. I think it would be interesting to learn the sizes of houses chosen by those 10 children. And, as a side note, several of them had no children or only one child. I think one or two of them had three children. A few years ago I looked for a small 2 bedroom home. The extra bedroom to do triple service as a library/guest room/office. As a retired widow I wanted a quality built home of maybe 1000 sq ft but found that many builders don’t build them that small…one company stopped at 1600 sq ft. and often when smaller they were cheaper built and would not offer the better quality cabinets, counters, etc. I assume because they thought if you wanted a small home you just couldn’t afford the larger ones and then they would cram 3 and 4 bedrooms into them. I wanted better quality so I did not have to worry about repairing cheaply made roofing, faucets, flooring etc. I definitely didn’t want useless luxury bling. I am at the age when I just wanted to enjoy the home.